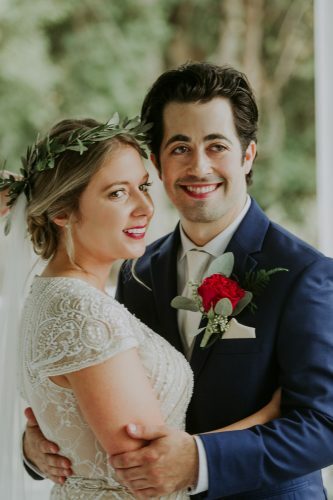 Raeann Sarah Harry and Rodney Mitchell Boothe were united in marriage on Saturday, Aug. 8, 2015 in an outdoor ceremony at Camp Otterbein in Logan. The Rev. Lonnie Potts officiated the ceremony. The bride is the daughter of Jill Harry of Marietta and the late James Harry. She is the granddaughter of Mr. and Mrs. James Starner of Marietta and the late Mr. and Mrs. Norman Harry. The groom is the son of Mr. and Mrs. Patrick Burns of Columbus. He is the grandson of Mr. and Mrs. Rodney Boothe of Roanoke, Va., and Mr. and Mrs. Gary Burns of Lady Lake, Fla. 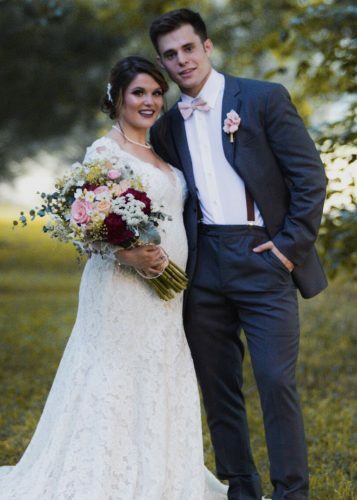 Given in marriage by her mother and escorted by her grandfather, the bride wore a strapless Maggie Sottero gown of satin and lace featuring embroidered designs and crystals on the belt. 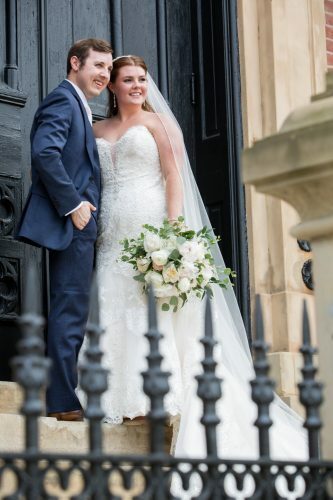 The cathedral length train was complimented by a handmade comb of blue crystals and pearls also worn by both the bride’s sisters at their weddings. The bride carried a hand-tied bouquet of light green hydrangeas, white calla lilies and lavender and green roses. Rilla Cooper, sister of the bride, of Henderson, N.C., and Sarah Cox of Circleville served as co-matrons of honor. Bridesmaids included Amie Leigh Reece, sister of the bride, of Cincinnati; Ricci Davis of Marietta; Lauren George of Xenia; Bria Howard of Canal Winchester and Bibiana Knuepper of Germany. They all wore wrap dresses in various shades of purple and lavender and carried hand-tied bouquets. Junior bridesmaids were Gracie Burns, sister of the groom, of Columbus and Esther Starner, cousin of the bride, of Marietta. They wore mint green lace dresses. Adam Reed, of Columbus, served as best man. Groomsmen included Christopher Burns, brother of the groom, of Columbus; Evan Cox of Circleville; Hunter McGonigal of Canal Winchester; Nicholas Martinez of Canton; Justin Stockmaster of Pickerington; and Evon Walston of Cleveland. Junior groomsmen were AJ Burns, brother of the groom, of Columbus and Elijah Reece, nephew of the bride, of Cincinnati. James and John Cooper, twin nephews of the bride, of Henderson, N.C., were ring bearers. Jill Drewyor provided music for the ceremony and Alyssa Hellwig was the soloist. Megan Geist, of Oxford, gave a unity reading. Program attendants were Emily Burns and Rylee Greene, both sisters of the groom, of Columbus. 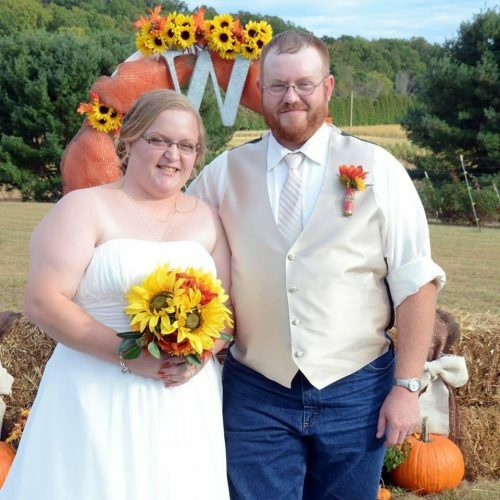 The bride’s mother hosted a buffet dinner and reception following in the lodge at Camp Otterbein. On the eve of the wedding, the groom’s parents hosted a rehearsal dinner at The Olde Dutch Restaurant in Logan. The bride is a 2010 graduate of Marietta High School. She graduated from Miami University in 2014 with degrees in both family studies and Spanish. She is pursuing her Masters in Counseling Ministries at the Methodist Theological School in Ohio. She works at Hopewell Health Centers in Logan as a case manager for Logan Elementary Schools. 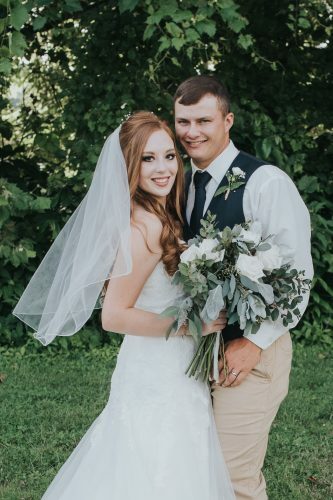 The groom is a 2012 graduate of Pickerington Central High School and will graduate in May from Ohio Christian University with a degree in Christian ministries. He is youth pastor at Leesburg United Methodist Church and will be pursuing a career as an ordained pastor. 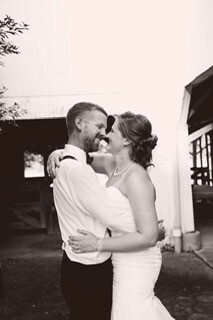 Following a honeymoon in Riviera Maya, Mexico, Raeann and Mitch will reside in Circleville.